And then the most significant breakthrough in the cannabis campaign since the Dangerous Drugs Act 1925 just…didn’t break through. No-one picked up the press release, no drug policy organisation in the country or the world did anything. Wikipedia didn’t update its article on medical cannabis. Perhaps it was because the entire thing is nonsense. 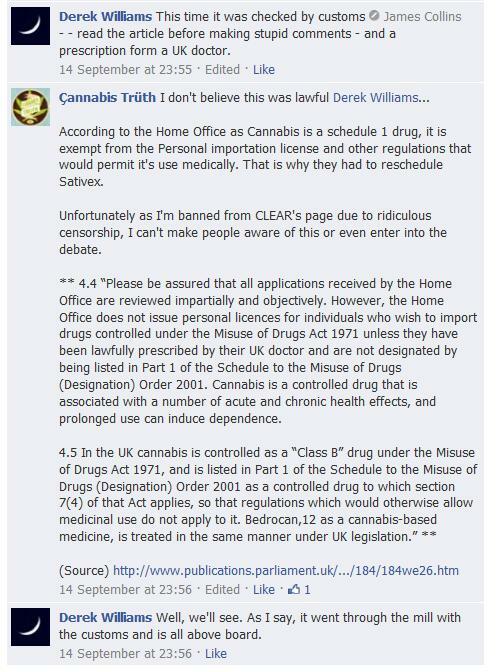 At NORML UK, we’ve been trying to check this out for some time – we got several requests from people wanting to know if importing Bedrocan was an avenue they could pursue, and the air of mystery Peter Reynolds, leader of CLEAR, drew over what it was that they’d actually done to make Clarence’s actions legal meant we had to take it seriously just in case they actually had gotten somewhere so we could appropriately inform our own membership. The law, so far as everyone understood it, had not changed. Cannabis is a controlled drug which you can only import into the UK if you have a personal licence to do so – a licence which the Home Office systematically denies to all medical cannabis users. 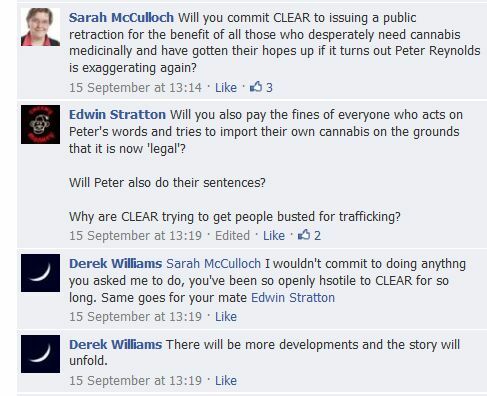 But despite numerous people saying this at the time that CLEAR made their announcement, Peter Reynolds, leader of CLEAR, and Derek Williams were absolutely adamant that medical cannabis was now legal to import,and to judge by the comments on their articles, sick medical cannabis users were starting to believe them. We needed more evidence. And finally, I emailed the Home Office for a formal statement on CLEAR’s specific claims. 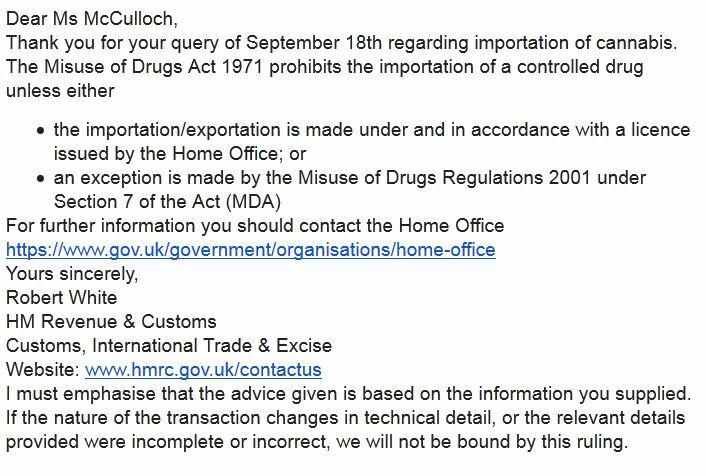 They got back to me today to say that CLEAR are wrong, you cannot import cannabis without an import licence for any reason and the Home Office does not grant import licences to individuals wishing to import cannabis for personal use. So why was Clarence let through with his 90g of Bedrocan? Most likely for the same reason the cops generally walk past cannabis smoke-outs – who can be bothered to make an arrest and fill out all the paperwork for someone going peacefully about their business? That doesn’t mean your actions were legal, only that you didn’t get done for it. If you go and light up in a park and don’t go to jail, that doesn’t mean that suddenly what you’re doing becomes permissible under the law. Our work as drug law reform activists would be a lot easier if it were that simple. Frankly, that Home Office letter should be disappointing to all of us. I do, after all, want medical cannabis to be readily available and on prescription in the UK – I have sick friends with convictions for whom the legality of cannabis is literally a matter of life and death. But I’m not in the least bit surprised to learn that, you know, medical cannabis is illegal, and that the current government’s official policy is that cannabis is dangerous and its use is associated with mental health problems. We all knew that. That I’ve had to ask the Home Office to confirm that is indicative of the extent to which CLEAR’s leadership lives in an alternative reality to the rest of us. 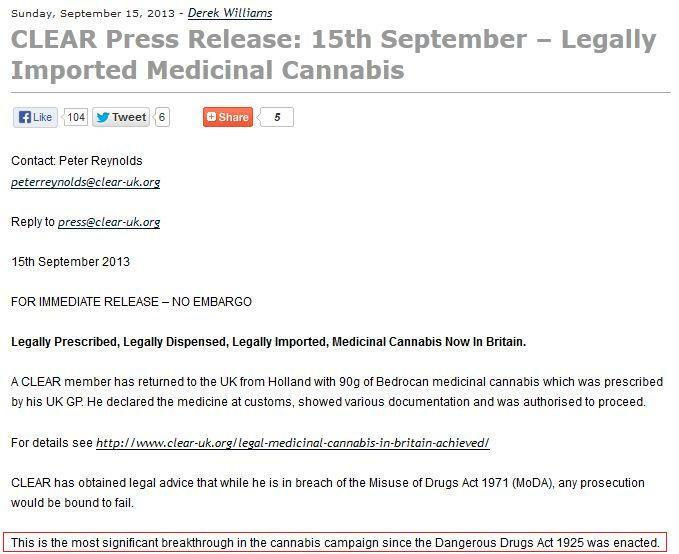 One may ask, why is it that Peter Reynolds, leader of CLEAR, and CLEAR were so adamant that the import of medical cannabis was suddenly legal? One might suggest that it’s because NORML UK had announced a cannabis hypocrisy demonstration two weeks earlier predicated on the idea that the importation of Bedrocan was illegal. This is, of course, now in the past. NORML UK’s demonstration was a success and CLEAR has once again published a cheap headline for which the word “inaccurate” would be as much an understatement as calling the current government “a bit right-wing”. 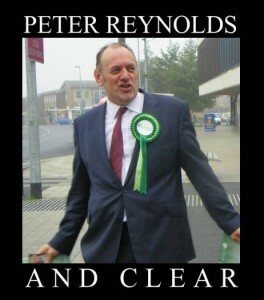 But will CLEAR be retracting the articles Peter Reynolds, leader of CLEAR, put out in defiance of all negative reaction? They are continuing to give people false hope, though I notice they have such confidence in the most significant breakthrough in the cannabis campaign since the Dangerous Drugs Act 1925 that you cannot find a reference to it anywhere on the front page of their website. They are also, as James Collins uncovered last week, potentially in breach of the law themselves by effectively encouraging and offering to help people to commit a crime. I did also write to Release, and as part of their recent website revamp, they have published full and separate guidance on the status of medical cannabis in the UK. Many thanks to them for that. I strongly suggest, the next time you hear something too good to be true (“Medical cannabis is legal”, “the cultivation of cannabis has been decriminalised”), you check that page. The red thing was an accident while cropping. 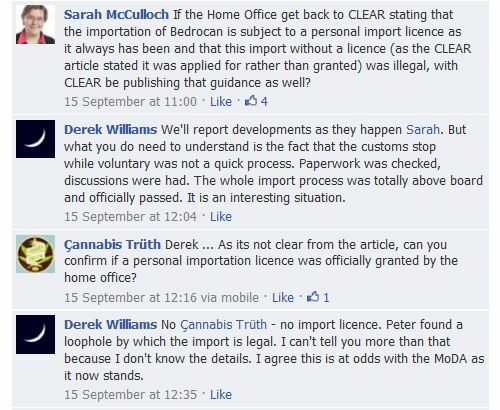 Let us set aside the fact that Derek had the nerve to post this and then three weeks later publish a 1200 word article trying to come up with every imaginable reason he could to claim NORML UK’s Bedrocan protest was pointless within 24 hours of my write-up (none of which were “the importation of Bedrocan by UK residents is already legal”, strangely). We have waited. We have seen. The Home Office has spoken. Will CLEAR now apologise for misleading everyone, including the desperate and ill medical cannabis users who are at risk of arrest and conviction if they attempt to follow this advice? UPDATE: Peter Reynolds did respond in a Facebook group to people questioning how he could reconcile his statements with the letter from the Home Office, by claiming that I am stalking him and people should stop wasting his time – and not addressing the Home Office letter at all. Which I think says it all, really. CLEAR are wrong, you cannot import cannabis without an import licence for any reason and the Home Office does not grant import licences to individuals wishing to import cannabis for personal use. DO NOT TRY THIS IF YOU CANNOT RISK A CRIMINAL RECORD OR YOUR CONDITION IS AGGRAVATED BY STRESS. I note that several peons from CLEAR are currently trying to blame me for writing to the Home Office to clarify the law on this situation, something I find deeply hypocritical given that one would hardly need to step softly around the issue if legal medicinal cannabis in Britain had in fact been achieved as they keep blathering. It seems to me at any rate that the film crews CLEAR started sending along to accompany their patients was probably a better explanation for Customs’ decision to enforce the law on this occasion. So, was he lying when he wrote this? Or did he do it and the Home Office got back to him with the same information that only I was willing to publish? Either way, what I warned about here and what many, many others in blog and Facebook comments feared would happen has now come to pass, and it would be nice if CLEAR actually admitted that what they have been doing is systematically misleading cannabis users instead of claiming that we’re all being Negative Nancys. Importing cannabis without an import licence is illegal, you can be busted if you try and Customs are willing to enforce the law. excellent investigative journalism, shame there’s not more of this in our main stream media outlets. 1. The patient must have a valid prescription from any doctor within the European Union. 2. A wholesaler or pharmacy in the country in question must then apply to the appropriate government agency for an import licence for medicinal cannabis. In the Netherlands this agency would be the Healthcare Inspectorate (Inspectie voor de Gezondheidszorg). 3. The import licence needs to be forwarded, in duplicate, to the Office for Medicinal Cannabis Research (OMC). 4. The OMC will then apply to the Healthcare Inspectorate (Inspectie voor de Gezondheidszorg) for an export licence. The export licence is generally issued within two to three weeks. In addition to an exemption, a contract specifying a number of details (e.g. the delivery of the medicinal cannabis) will also need to be drawn up. 5. As soon as the contract has been signed and the export licence issued, the quantity of medicinal cannabis ordered can be dispatched. 6. The wholesaler or pharmacy then dispenses the medicinal cannabis to the patient. Import and export licences are only valid for a limited period. Once this period has expired the procedure must be repeated in order to obtain a new licence. Costs include the application fee for the export licence and contract and transport costs. I’m currently following this procedure in Ireland with my GP; and awaiting conformation from the Irish government that it is viable. It may well be worth UK patients likewise informing their GP’s of this procedure; and asking them to apply accordingly. There are many E.U. countries where Bedrocan is now legally available by following this procedure – well past time our island national governments got continental + woke up to the 21st century. 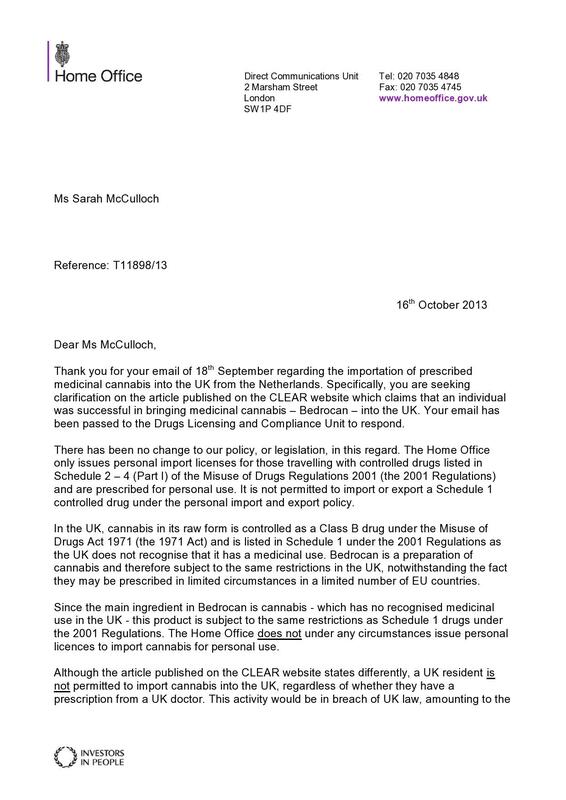 I made an application to the home office in the last 12 months for an import license for Bedrocan and it was refused. I was told to see my GP about Sativex, i even had the support in writing from my surgeon, i have been denied Sativex (i expect due to cost). 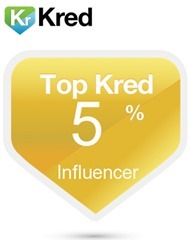 I wanted to add my congratulations for an excellent, thorough and incredibly well presented and evidenced article. You have done medicinal cannabis users a real service and CLEAR and PR should be thoroughly ashamed of themselves for confusing and putting at risk medicinal cannabis users. I know your principled stance against CLEAR has come at a cost. Your courage and persistence is an inspiration.Well done you and well done NORML UK. Top activism and investigative journalism! Many thanks for this work. As drug law reformers, it’s vital that we’re diligent, rigorous and truthful about the evidence in the way that you exemplify. People who don’t do so hinder and bring shame on our movement. Exaggeration, distortions and playing fast and loose with the truth are strategies that I think we should leave to prohibitionists. I like Mici Mulcreevy’s comment because it suggests that there may indeed be legitimate avenues to be explored. If patients can persuade their GPs to make applications, that will put pressure on the authorities to respond. 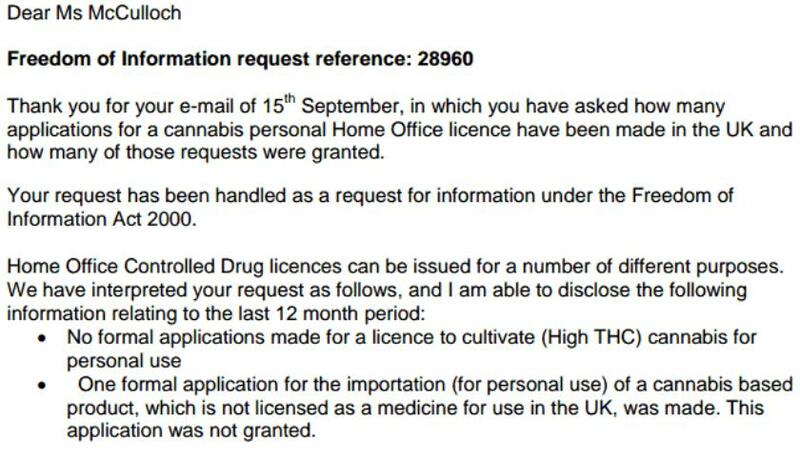 Also, Paul’s comment casts doubt on the Home Office’s claim that there was only one request for a license to import Bedrocan in the last 12 months. Previous post: Compare my blog to the Holocaust and you will be banned.